This photo turned up early in 2014 - you can see the colours of the dotty blouses shown in picture 5! With a bit of thought we have identified most of the members. We'd also like to identify when it was taken: 1980s? If you can help, please let us know!Click here to contact us! Back row: Joan Tepper; Avis Neilson; Mary Cox; Pam; May Broad; Beryl Allonby; Shirley Clegg; Mrs Metcalfe (behind Rosemary Hoyle's dark bob! ); June Stewart; Joyce Jackson; Dot; ? (Janet Taylor or Luise Crawley); Mary Perry. 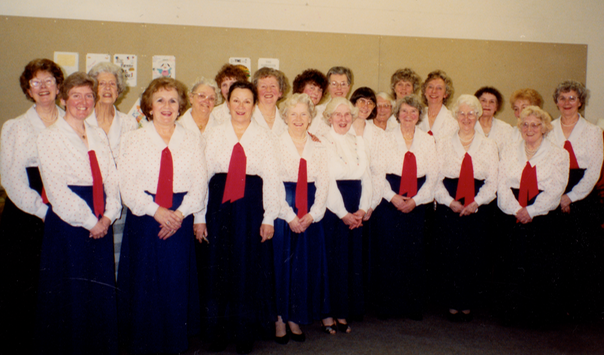 Front row: Jean Barrett; Molly Allonby; Dora Jarvis; Dot Croft; Musical Director Anne Hoyle; her daughter Rosemary peeping over Ann's shoulder; Mrs Long; Winney Moore; Nancy Marsden.